My Twitter feed today led to this post by @EveryChildMattersinIowa, who had just started following me. I clicked into their map, and it led me to this page, which contains child care availability data for every state, including Illinois, which I show in this graphic. This is an interactive map, so you can zoom into different parts of Illinois and every state. The way the Iowa group used it in a Tweet is exactly how I hope others will use maps, from the ones I make, to the ones I point to in blog articles on this site. If you're doing this, post your link in the comments below. 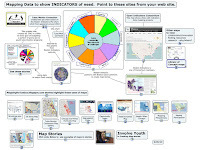 Field Foundation Data Maps - Great Resource. Who Else Using It? I was pleased to find this map on my LinkedIN feed today, which is from the Field Foundation of Illinois web site. 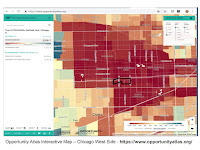 Visit the site and open this PDF and you will find a series of data maps, showing areas of Chicago where extra investment is needed, based on a variety of indicators. 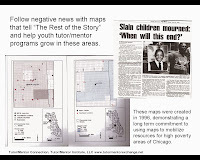 If you have looked at articles on this blog, or this section of the Tutor/Mentor Institute, LLC blog, I've been using maps for more than 20 years to focus attention and resources to areas shown on the maps as needing extra help. Among the maps in the Field Foundation pdf is one showing a lack of arts programs in high poverty areas. What's not included is a map like mine at the right, showing the availability of non-school tutor and/or mentor programs in these areas. I hope that I'll be able to connect with foundation leaders and that they will look at the many articles I've posted showing ways the maps can be used. If they point to these, or write similar articles on their own web site, perhaps more leaders would be using the maps, and thus, more resources would be flowing into these areas. 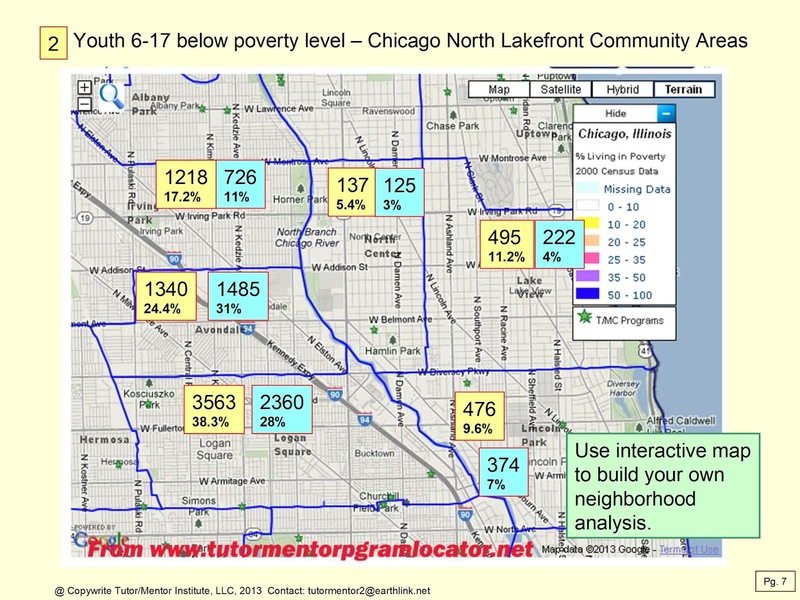 One other resource I'd like to point to is this PDF that shows the number of high poverty youth, age 6-17, in each Chicago community area. The map at the left shows the far North East part of Chicago, which includes Rogers Park, Uptown and West Rogers Park. Based on the number of kids in these areas, investment in tutor/mentor programs is also needed here. I've not been operating as a 501-c-3 non profit since 2011, so I'm not eligible for a Field Foundation grant, yet I have not found investors or a source of income to help me maintain and update my mapping platform. A contribution to my FUND ME page would help. A partnership with a foundation, university or business would help even more. I've posted articles showing network analysis tools in the past. Thus, today I was excited to see the Tweet which is shown below. I signed up for a free account and browsed around to see what's available. It's pretty easy to use. Blow is a screen shot of people who mentioned @tutormentorteam (me) between May and December 2018. If you've read any of my past articles my interest in these tools is the potential to provide on-going support to community-building efforts, or bringing people together to solve complex problems, such as making well-organized, long-term, volunteer based tutor, mentor and learning programs available in every high poverty neighborhood of Chicago, and keeping them there for a decade or longer. Without these analysis tools we could fill a football stadium with fans and still not know if we have the right mix of talent, experiences, political leadership, resource providers, program experts, etc present to work on solving our problem. Unless we repeat the analysis on an on-going basis we don't know if our efforts are keeping these people in the conversation, and expanding the range of people involved. I don't have the time, talent, dollars or manpower to do this analysis myself in all the ways it should be done, which is why I keep inviting others, from Chicago, or any where in the world, who is interested in this, to reach out and introduce yourself. 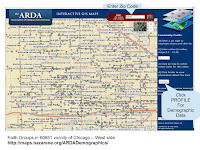 This screen shot shows interactive map included in WBEZ article titled "Clear Signs Of The Digital Divide Between Chicago’s North And South Sides"
The article reports that "more than half the households in Englewood and nearly half the households in West Englewood (51 percent), Riverdale (49 percent), Auburn Gresham, and South Shore (both 46 percent), lacked internet access at home". This is a disadvantage for youth and adults. I show these maps and articles with the goal that readers will be concerned and will share the articles with others, who will also be concerned, and that this will result in people from different sectors giving time, talent and dollars to help reduce this problem. Browse other articles on this blog, and the Tutor/Mentor blog, and share with your network, as the graphic below suggests. This work is not something that can be done in a day, or even a year or a decade. But it is work that needs to be done. If you'd like help digging through the information I'm sharing, or in making sense of some of the graphics, I'm available. 12-12-18 update - Visit this site and see 2018 data and maps showing digital access in census tracts across the USA. If you appreciate what I'm sharing, please visit my FUND ME page and send a contribution. My Twitter feed brought to my attention this map showing population density in the largest US cities. You can find the article describing contents of the map here, and the interactive map here. 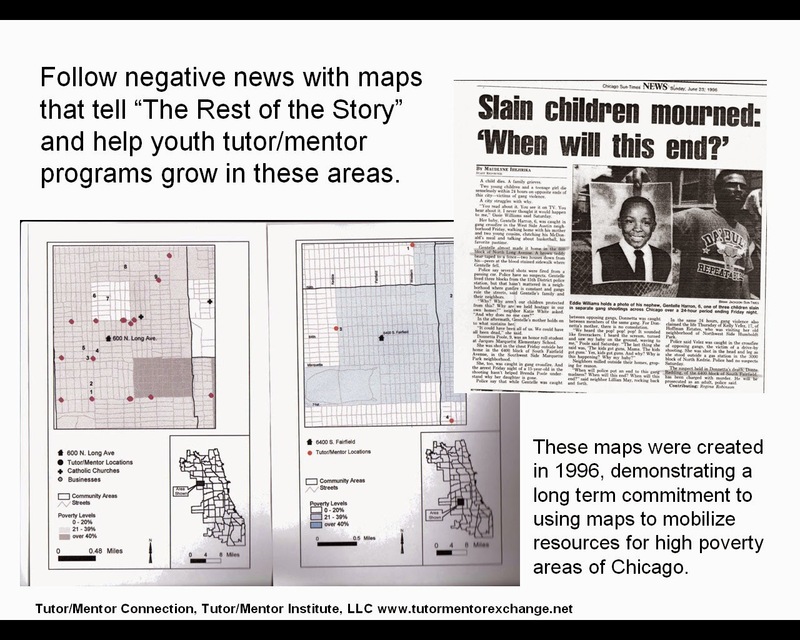 I created the Tutor/Mentor Connection in Chicago in 1993 to help volunteer-based tutor/mentor programs grow in high poverty areas. As the Internet became a tool for me to gather and share ideas, I've sought out people in other big cities, because the challenges of concentrated poverty, segregation, inequality and population density are similar. That means that some day I should be able to produce a map, with icons on each blue circle, indicating one, or more, people from that city is following me on Twitter, Facebook and Linkedin, reading my blogs, and interacting around the same challenges and questions I ask every day. In the map below I show people who attended Tutor/Mentor Leadership and Networking Conferences that I held in Chicago every six months from May 1994 to May 2015. If you compare it to the population density map, you could see that I was connecting with people from some of these cities. However, those connections did not turn into on-line connections and, for the most part, on-going connections. They also did not include business leaders, funders and/or policy makers, which is one reason I no longer host the conferences and struggle to keep the T/MC alive in Chicago. I'm still trying, but I think it will take finding others from different cities to help with this effort. 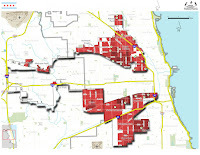 In addition, each city should have someone creating maps showing who is connecting on a regular basis to help needed youth serving programs grow in that city. The map at the right shows participation in one of the Chicago conferences. You can see several maps like that on this page. 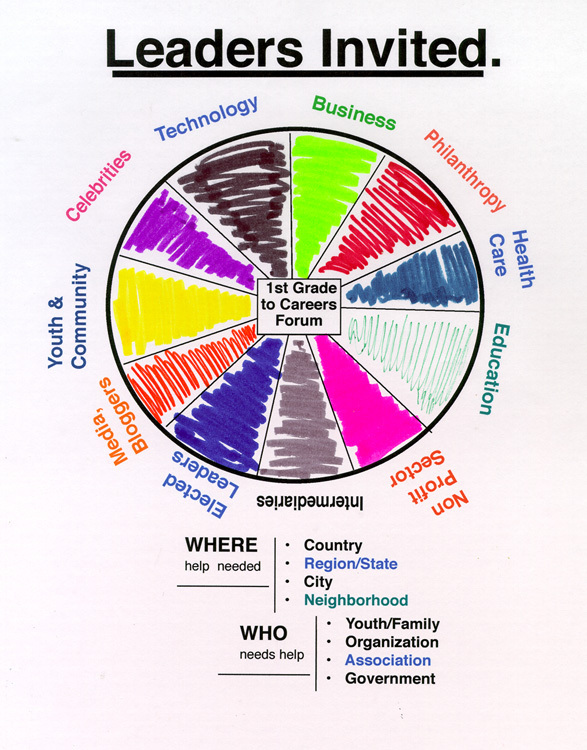 If this were happening it would indicate that groups of people are meeting within a city, and within neighborhoods of each city, and that they were connecting with people in other similar cities, with a common goal of helping economically disadvantaged kids more successfully through school, which has a economic benefit to the business sector and the entire urban region. So far I don't see this happening. Thus, if you're reading this. 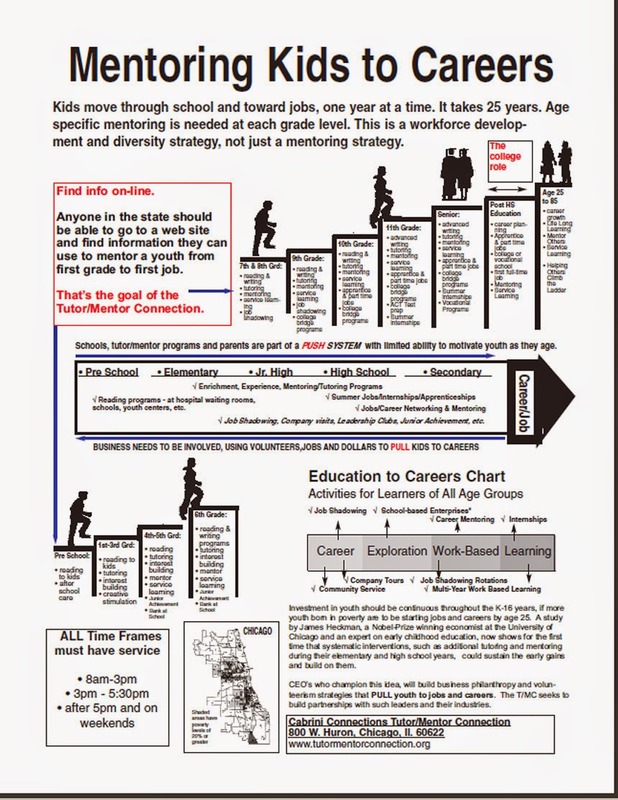 Share it with people in your own community and network who might also be focusing on filling high poverty areas of their city with a range of mentor-rich programs that reach more k-12 kids, last longer, and result in more being in jobs when they are in their mid 20's than what is the reality today, in 2018. In this Vox.com article the author shares sixteen maps that most American's probably don't spend much time thinking or talking about. I created this montage from the maps in the article. Below is a Tweet that points to article in today's Chicago Tribune, describing the different opportunities available to youth in different parts of Chicago. In the concept map shown below I point to several different data platforms that you can use to understand where people need extra help. Click here to open cMap. Then click on box under each node to open links. The number of data maps has grown tremendously over the past 10 years. However, the number of people using these as tools to guide needed resource, jobs, health, education and youth support programs into each of these areas has not yet grown to the same extent. 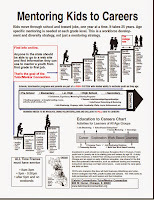 I created the Tutor/Mentor Connection in 1993 with the goal of collecting and sharing information showing work being done in some parts of the world that could be borrowed and duplicate in other places. Instead of constant reinvention, we need constant learning and innovation. 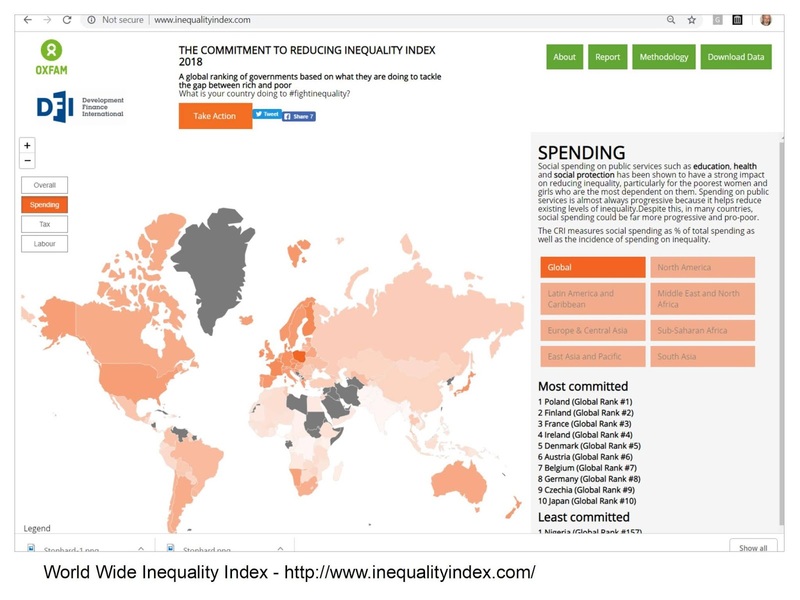 With that in mind, here's a web site/data map showing a World Wide Inequality Index, which is an annual "global ranking of governments based on what they are doing to tackle the gap between rich and poor". Here's another example. 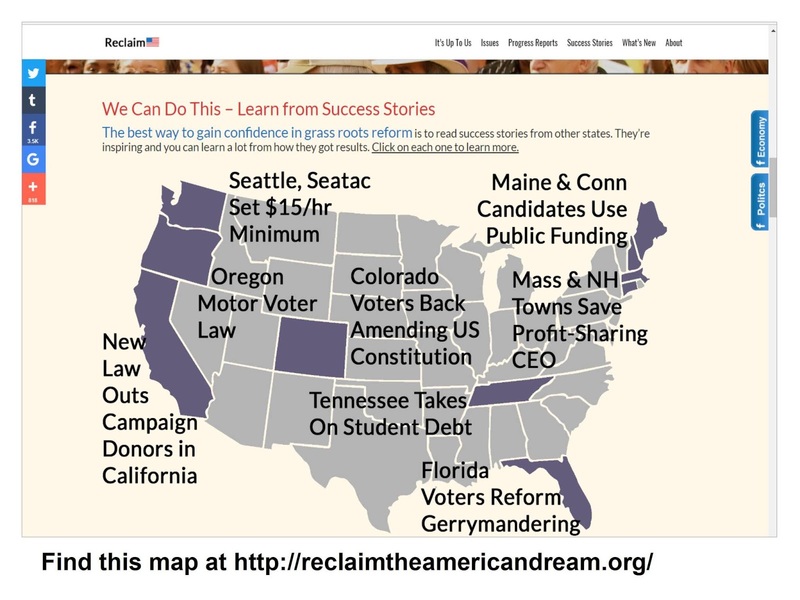 This is from the Reclaim the American Dream web site. 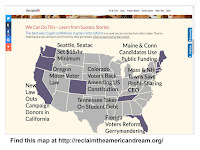 On a map showing US states you can find information showing legislative work being done in some states that can be inspiration and models for similar work to be done in other states. 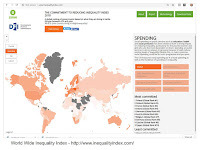 I learned about the Inequality Index from an article on the From Poverty to Power blog, which is one of the blogs I point to in the web library. I don't have any money for advertising (never had much) so use my blogs and social media to try to draw attention to the information I'm putting in my library. As others share this in their own networks, my goal is that more people will learn to use these platforms to learn what's working in some places that might also work where they are located, if they can find resources to implement the ideas. 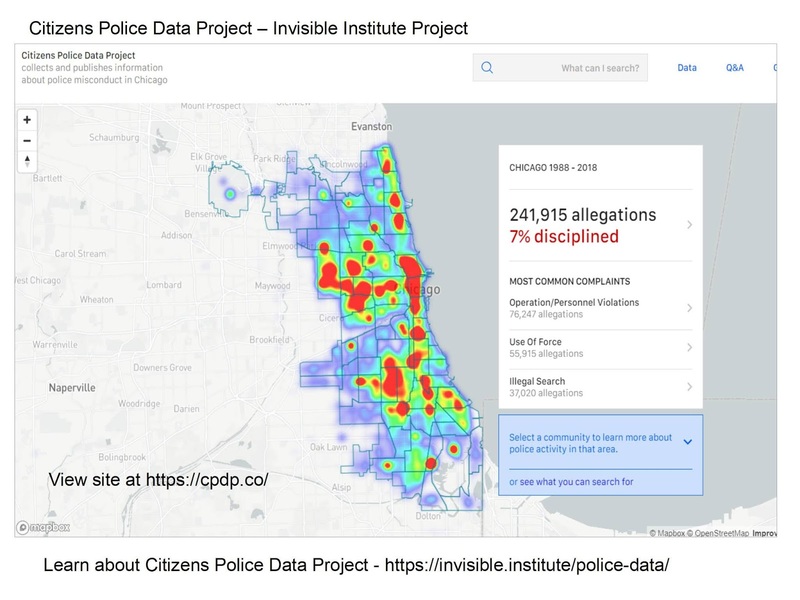 Thus, getting people involved from every sector is really important if we want to try to reduce some of the complex problems facing us in Chicago, the US, and around the world. You can help by following this blog, or the Tutor/Mentor blog, and sharing posts on social media sites. If you value the work I'm doing, and the web library I host, please visit my FUND ME page and send a contribution. 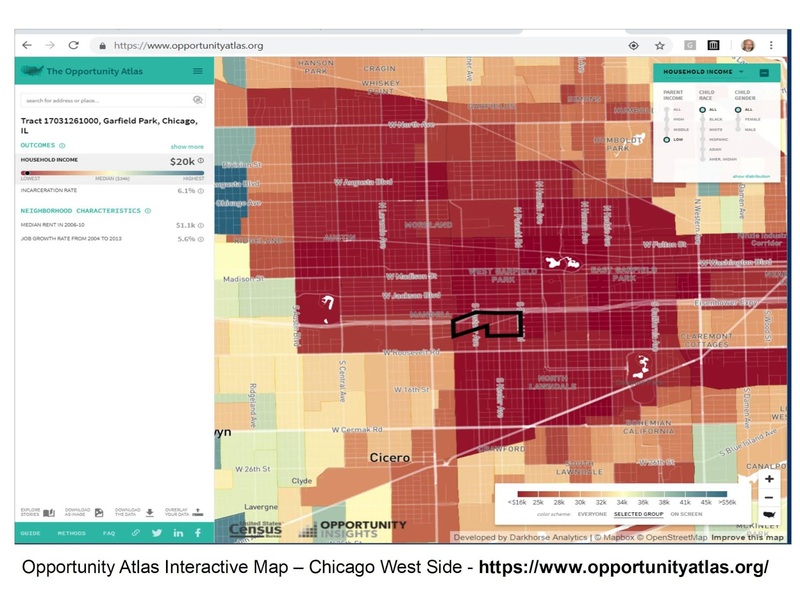 On Monday I posted an article showing a map of Chicago's West Side neighborhoods, using an Opportunity Atlas which was featured last week in a New York Times article, and has been mentioned often on social media since then. 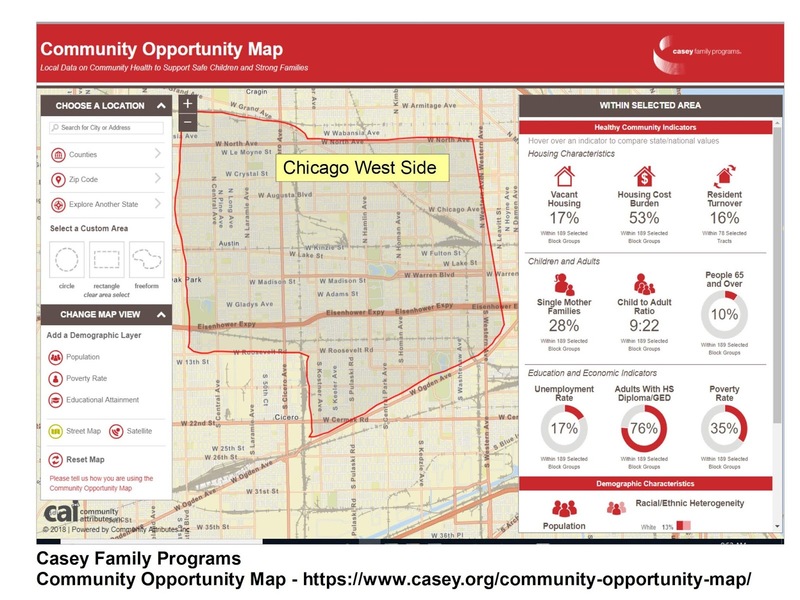 Today I found a different Community Opportunity Map, created and hosted by the Casey Family Programs. Both of these platforms offer a load of information. I am particularly impressed with the Casey map, in how easy it is to draw boundaries around an area and receive a table of data showing different indicators for that area. 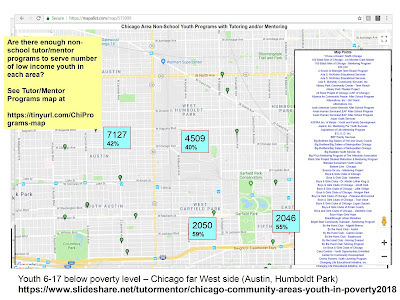 I drew the entire West side just to compare one map with the other, and with the map I host that shows non-school youth tutor and/or mentor programs in the same area. 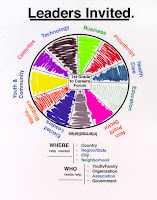 Neither of the two opportunity maps has layers of information showing youth and family services and other assets in these areas, which all need consistent attention and an on-going flow of talent, ideas and operating dollars to be effective. Thus, users will need to do what I do, which is combine map views from different platforms in order to tell a story that starts out showing where people need help, then moves to an analysis of what help is already available, and then a conversation of how to help existing services grow and stay available, while also filling voids where more services are needed. If this is a process you're applying through your planning and community support efforts, please share a link to a web site where you describe and show your work. Like the information I'm sharing? Go to this FUND ME page and send a contribution to help me keep doing this. 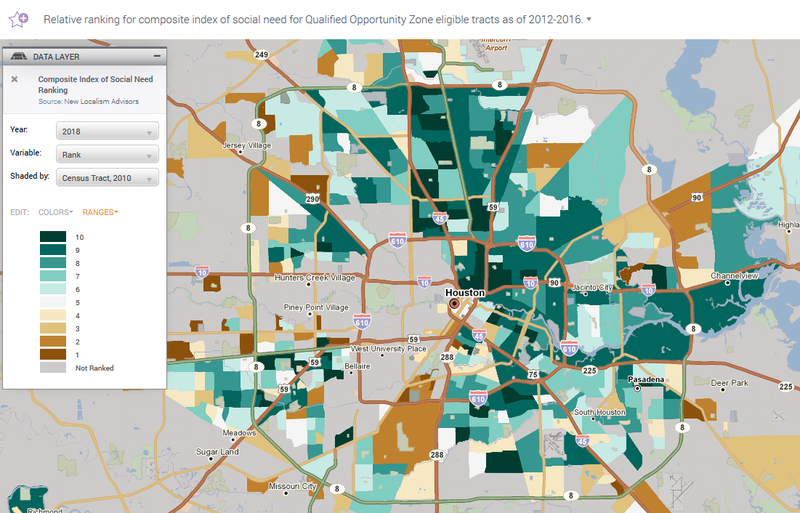 Below is a Tweet from today showing maps created using the Opportunity Atlas which is a resource of Opportunity Insights. If you view the Tweet you'll see links to a New York Times article in which the map is described in detail. 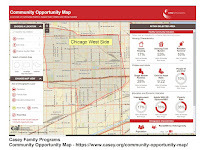 Below is a map view, showing Chicago's West side, which I created using the Opportunity Atlas. I've added a link to this site in the Tutor/Mentor web library and to a concept map which I use to show links to data indicator platforms like this. What's great about this Opportunity Atlas platform is that it enables you to zoom into the neighborhood level. Thus, you can focus on pretty small sections of Chicago or other places to understand where people have the greatest need for greater youth and family support systems. 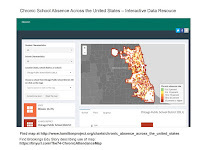 I've been using data maps to focus attention on places where people need help and to draw resources to non-school tutor/mentor programs operating in these areas. Or to help create new programs where too few exist. 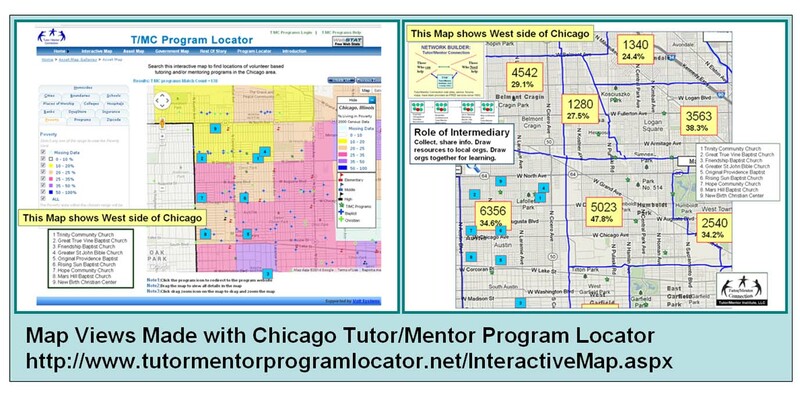 I maintain a list of Chicago tutor and mentor programs which I show on the map at the right. If you were to compare this, to other data maps, you'd see that this is where programs are needed. Now you can click on the icon for each program, then go to their web site, and try learn what they do, who they serve, and how you can get involved, or help them constantly improve the impact of their work. 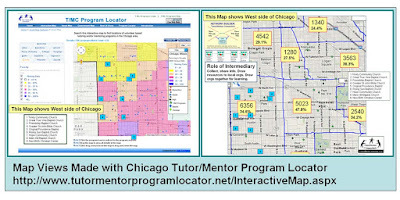 Visit the Tutor/Mentor blog articles here, here and here, where you can see a couple of recent articles I wrote using maps of Chicago neighborhoods. 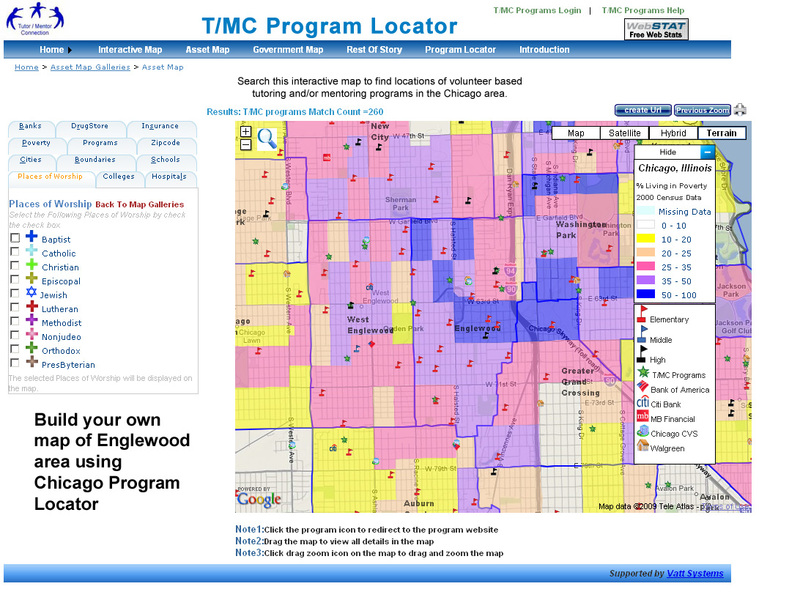 Here's an article on this blog, where I used the interactive Tutor/Mentor Program Locator to create a map view of Chicago's West side. 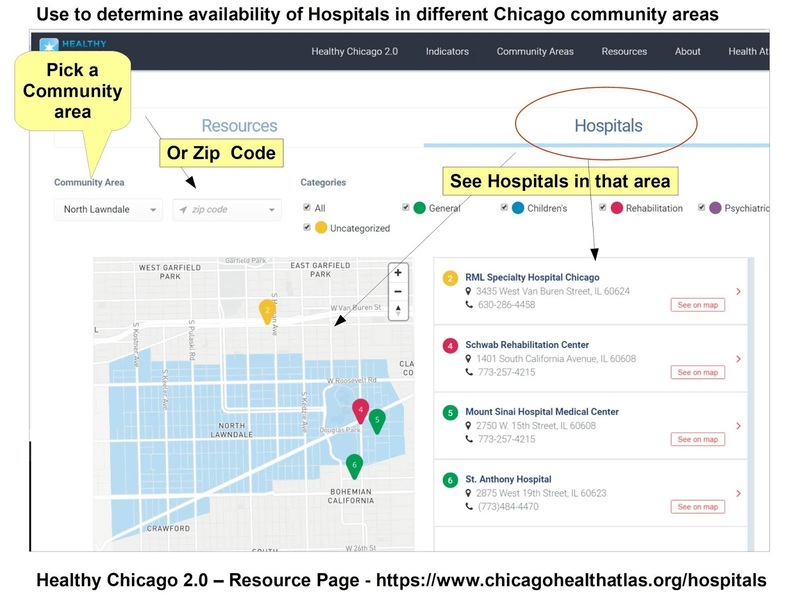 The Program Locator was built in 2008 and has layers of information that include assets (business, faith groups, hospitals, universities, political leaders) who should be working to fill neighborhoods with hope and opportunity, because they share space in those areas. Unfortunately, the Program Locator is not working and I don't have the funds or tech skills to fix it. 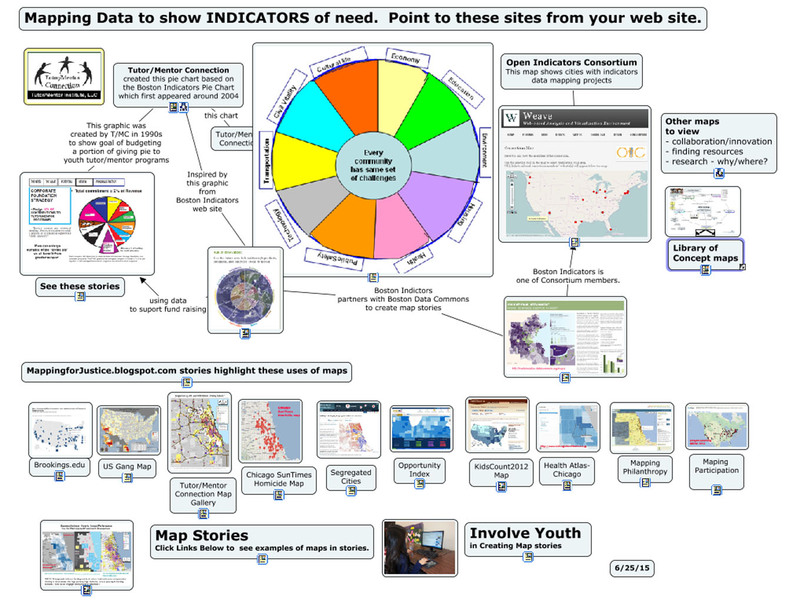 And I don't see many (any) who are using data maps the way I have been, to try to mobilize resources to build and sustain needed youth and family services in all of the areas where the data maps indicate there is a need. That's why I keep asking people to help me, and to make contributions to my FundMe page. 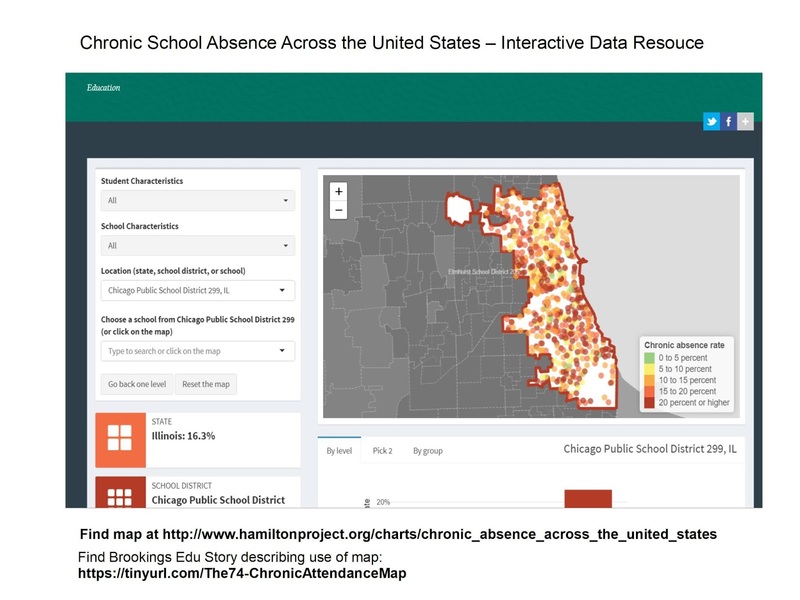 The map at the left is a screen shot of this page, which host an interactive data map that shows chronic school absence rages for areas as small as a single school. This article provides a great tutorial on how to use this resource. I zoomed into Chicago and could have created an even closer view of any part of Chicago. However, this resource covers the entire country. 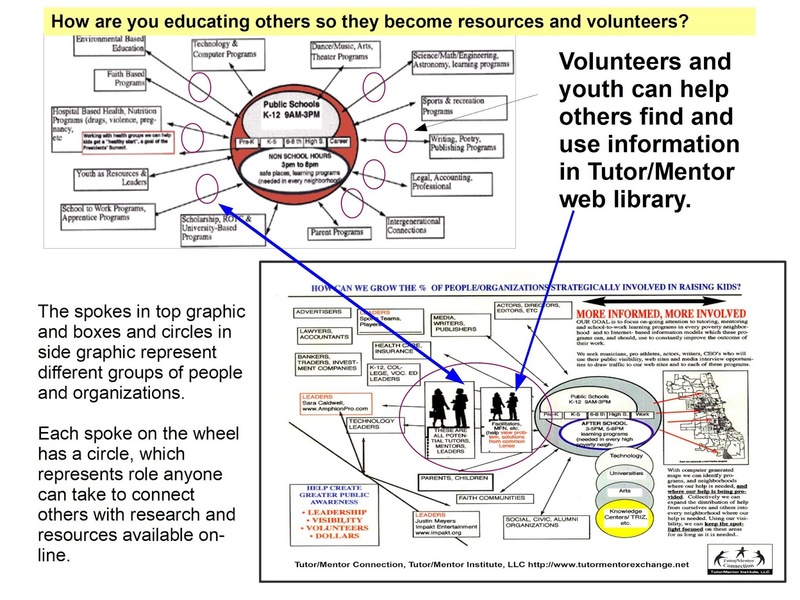 The goal of the articles on this blog and the Tutor/Mentor Blog is to influence what other people do to build and sustain mentor-rich non-school programs where volunteer tutors and mentors help kids move through school and into jobs, over many years of support. In this graphic you can see a small map of Chicago inserted at the bottom, with high poverty areas highlighted. Comprehensive, mentor-rich programs are needed in every one of these areas. 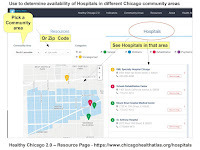 I focus on roles business, hospitals, universities and faith groups can take to make great programs available in more places and in this article I'm introducing a new resource that shows faith groups in different zip codes of Chicago. 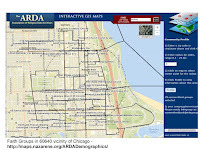 This map was created using the interactive map on the ARDA (Association of Religious Data Archives) web site. This map view is showing the area around the 60640 zip code in Chicago. 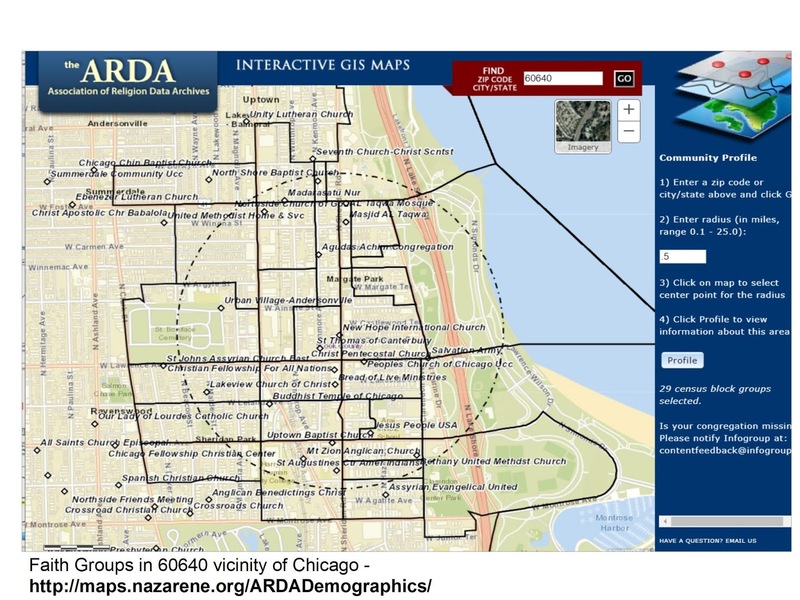 The ARDA Research Hub includes this data map and a huge library of additional research. 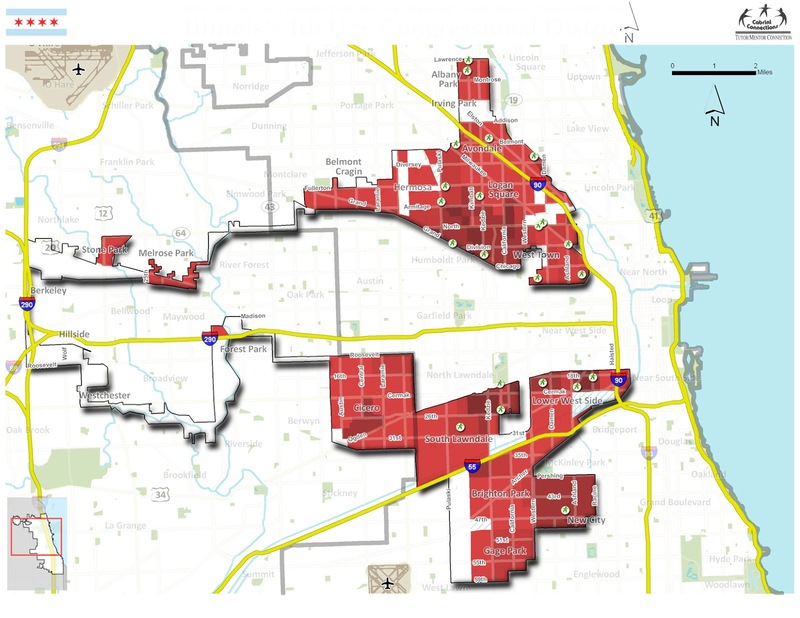 Here's a second map, showing the area around the 60651 zip code, which is the Austin community area of Chicago. There are literally hundreds of faith based groups on this map. On the graphic I'm pointing to a button you can click to get more information about the area highlighted. 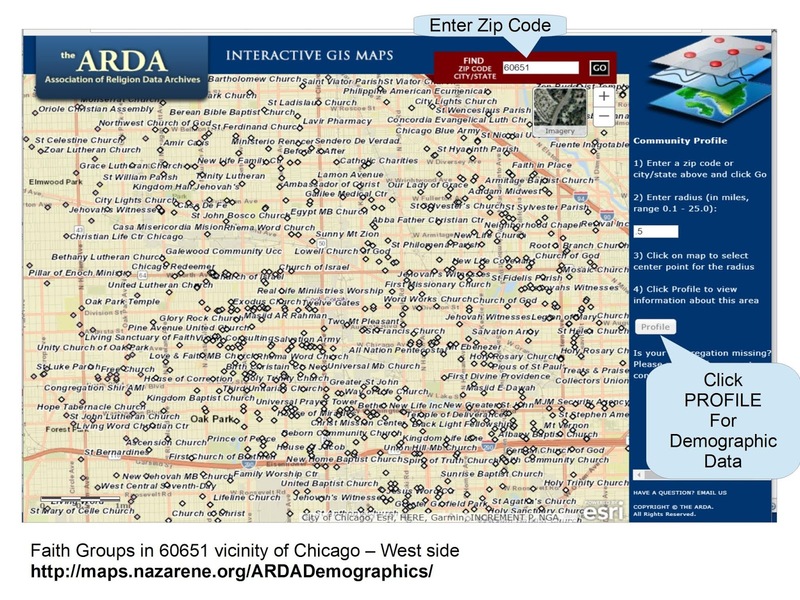 At the top of the graphic I'm pointing to where you enter a zip code (any from the entire US) to find data showing faith groups in that zip code. Spend time getting to know the site. It looks like a great resource. 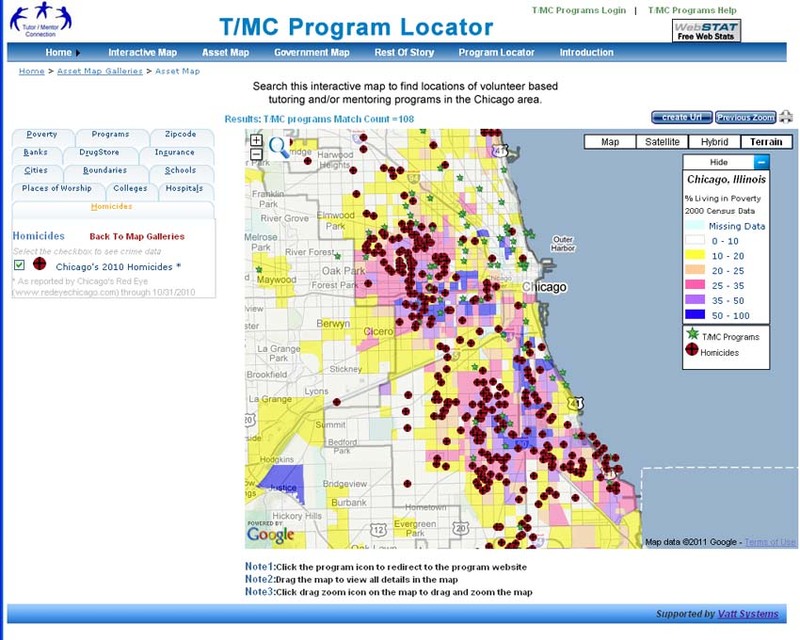 Below is another map, created using the map of Chicago tutor/mentor programs that I host. In this map I'm also showing the Austin area, along with Humboldt Park and West Garfield Park. On this map I am showing the number of high poverty kids, age 6-17, in each of these community areas. The green icons on the map are non-school tutor and/or mentor programs in my database. Now, if you compare my map to the map showing faith groups, you'll see that there are dozens of places where kids and volunteers could be meeting as part of organized, on-going, tutor/mentor programs. Below are two more maps showing the Austin area. On these the blue boxes are locations of churches where mentoring programs were operating around 2011 and 12. These never made it into my database and I can't find evidence (web sites) showing that programs are operating in these areas. 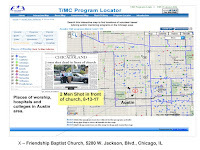 My goal is that leaders in the faith community, in hospitals, colleges and/or businesses, or even politics, use my maps and other information on my web sites, as part of a process that identifies existing programs and then draws regular, on-going attention to them, helping each attract volunteers, ideas and dollars, so youth in each program have the best possible help moving through school and into adult lives. I've shared this since 1999 but still don't know if anyone is actually applying these ideas. However, as long as the daily news keeps reminding me of the need for support systems that help guide kids to positive life choices and adult lives where they can raise their own kids free of poverty, I'll keep sharing these ideas and resources. If you look at the Tags on the right side of this blog you can find other articles that I've written on this topic. If you want to help me do this, please visit this page and use the PayPal to send me a contribution. 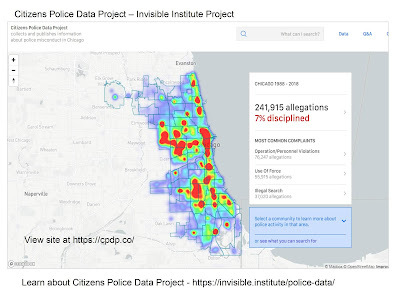 Below is the home page image from the Chicago Police Data Project, created by the Invisible Institute to collect and publish information about police misconduct in Chicago. Visit this page and view the video that shows how this information can be used. 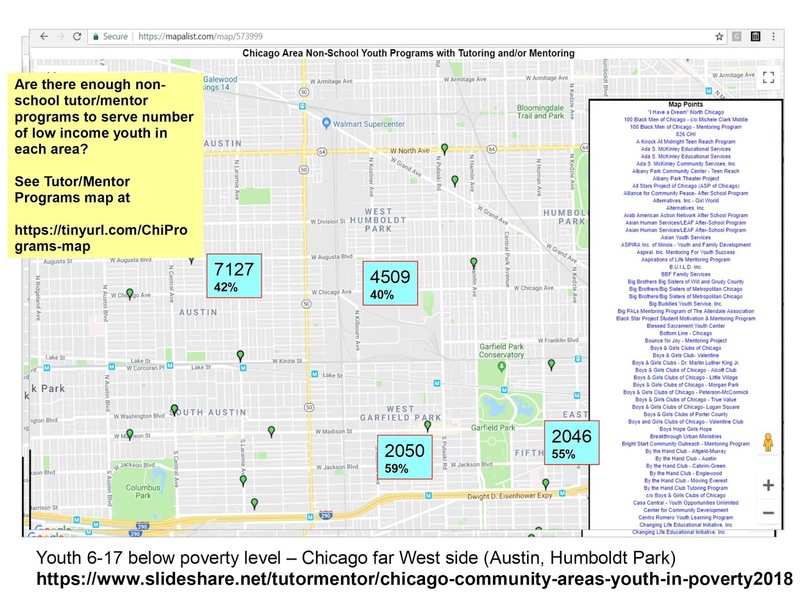 Over the past few weeks I've posted a few stories on the Tutor/Mentor blog showing other data platforms, such as Healthy Chicago 2.0 and DuPage Impact. Click here, here, here and here to see three recent articles. The common theme of all of these is that poverty concentrations on the West and South parts of Chicago show many indicators that people need extra help from public and private services. 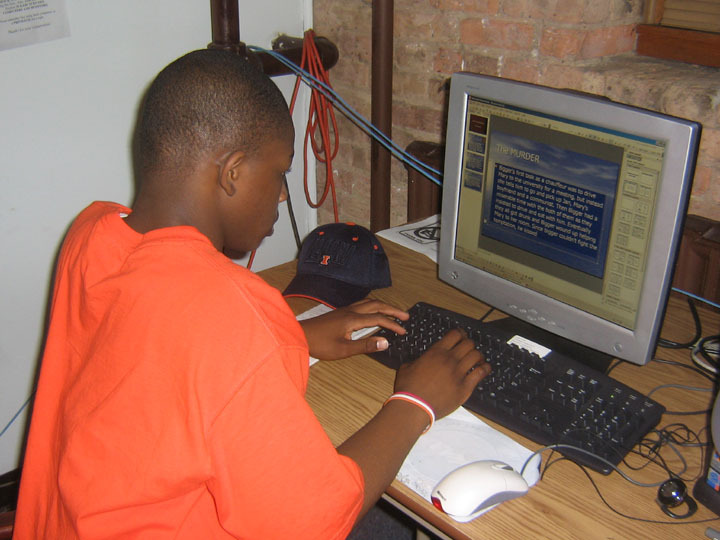 I've posted more than 150 stories since 2005 on the Tutor/Mentor blog where I point to violence in Chicago in an effort to motivate more people to help mentor-rich, non-school youth programs grow in these areas. I can't do this alone. I invite others to use my stories as a template, and these platforms that I point to, and create your own map stories. 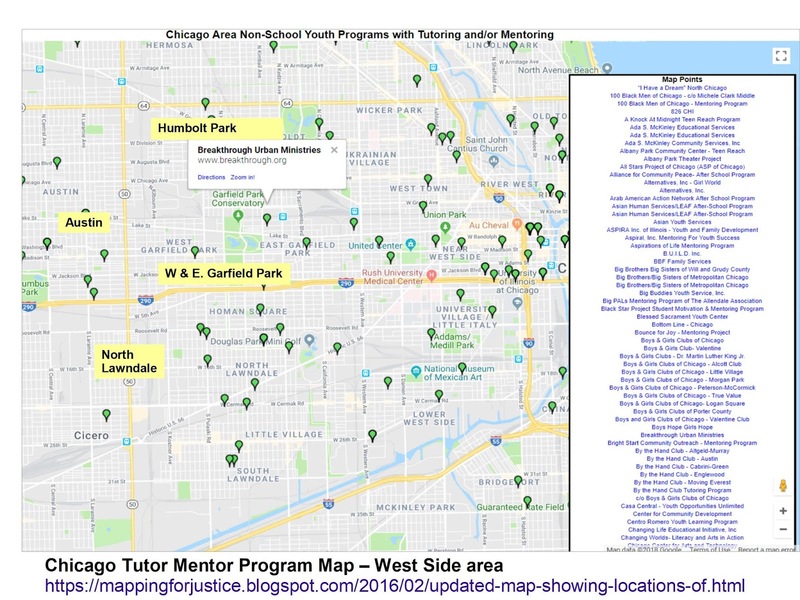 If enough of us do this daily or weekly perhaps we'll be able to influence what power brokers do in Chicago to help fill these map-areas with a wide range of needed supports for youth and families. 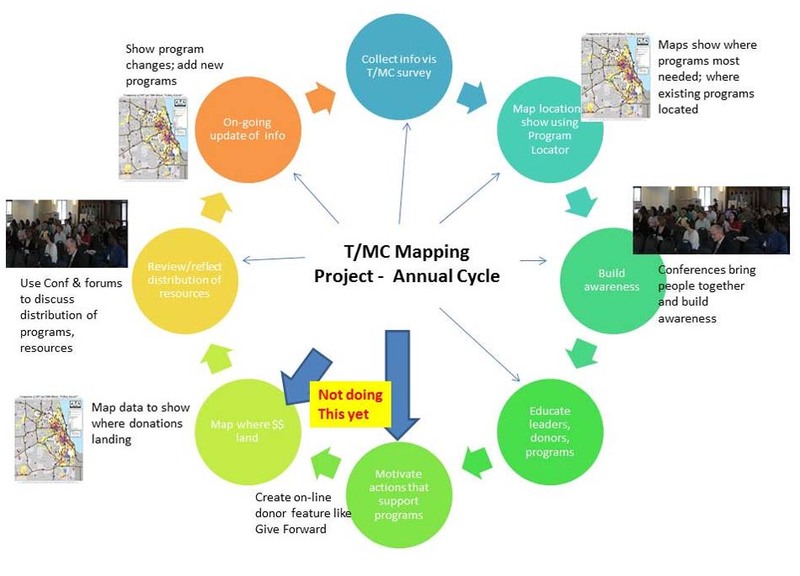 The Tutor/Mentor Connection started using maps in 1994 to help leaders understand where non-school, volunteer-based tutor, mentor and learning programs were most needed, and where existing programs were located. This blog was created in 2008 to share maps that we were able to created between then and 2011. I've encouraged politicians to use maps since we launched this strategy. Sadly, I've never seen this happen consistently. 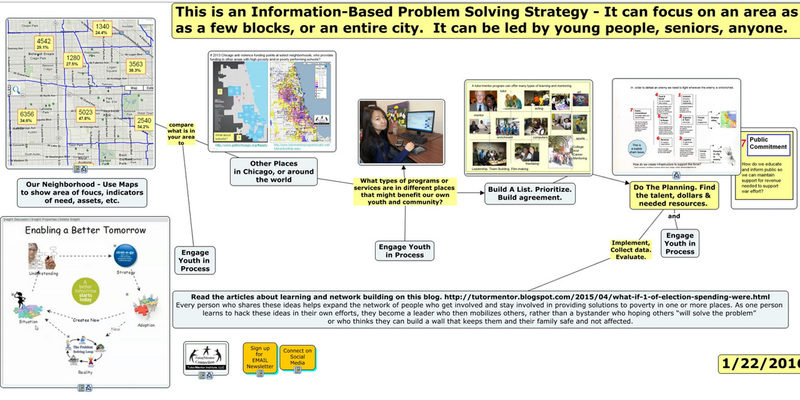 See more articles and ideas for using maps on this page of Tutor/Mentor Institute, LLC web site. 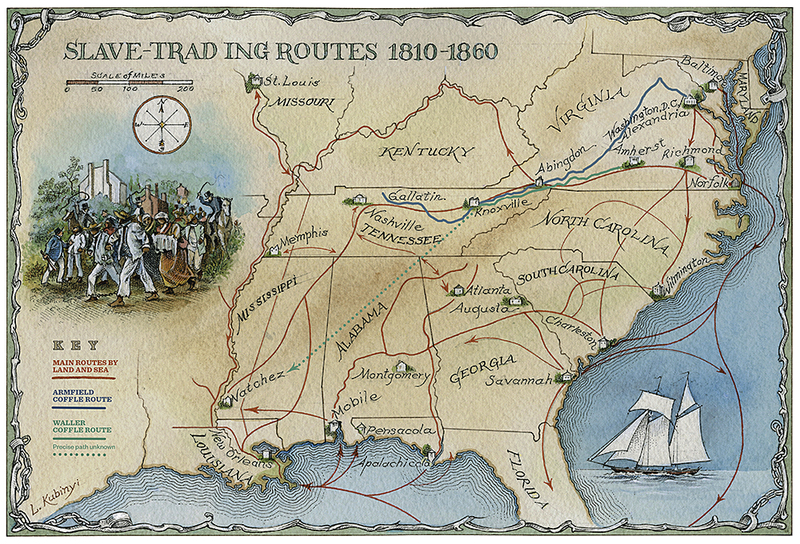 Browse past articles on this blog and the Tutor/Mentor blog to see ways maps can be embedded into stories. Help me keep the Tutor/Mentor Institute, LLC resources and stories like this on line. Make contribution using PayPal form on this page. Interested in helping me rebuild and update this resource? Introduce yourself with comment or connect with me on Twitter @tutormentorteam or on Linkedin. The Federal Reserve Banks have a wealth of resources on their web sites. This map is from the GEOFRED site of the Federal Reserve Bank of St. Louis. Read the blog article and follow the links. 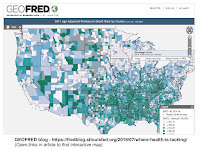 GeoFRED maps can help us understand a lot of things, including trends in regional socioeconomic data, which could ultimately provide insights for policy recommendations. In this post, we look at two important indicators of health throughout the United States: premature deaths and preventable hospital admissions. High levels of premature deaths indicate issues with public health. 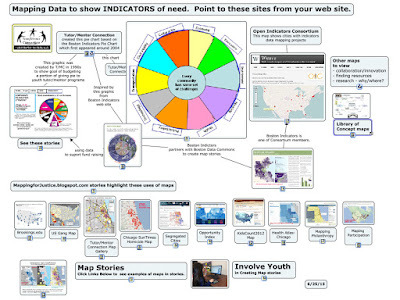 I've been posting links to mapping and data platforms on this blog since 2011. 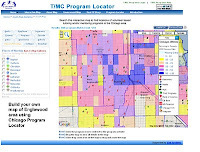 Original articles, posted between 2008 and 2011, show map stories created using ESRI GIS software and an interactive Chicago Tutor/Mentor Program Locator (created in 2008). My goal is to provide tools, and examples, that encourage many others to create map stories that show indicators of need in different places and draw attention and resources to organizations working in those areas to help kids and families. 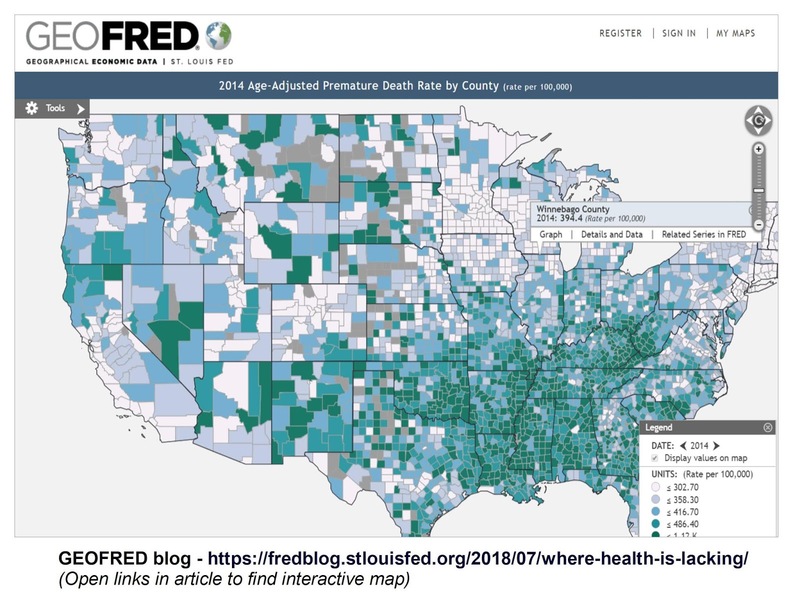 In this article I've been aggregating links to additional articles that include data maps. If you're creating maps stories using some of the platforms I point to please share links to your blogs and tell of the successes (or challenges) you are having. I'm on Twitter @tutormentorteam and my feed constantly introduces me to new ideas. At the left is a world map showing migration patterns, to new countries and from home countries. It was created using a combination of Geographic Information Systems (GIS) maps, and Social Network Analysis (SNA) tools. This article shows how the map was created, tells why it was created and points to a live tool that anyone can use to better understand one of the most important issues facing the US and the world as we move further into this century. 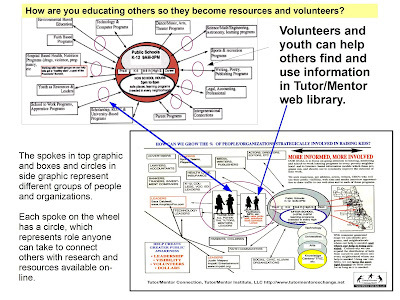 If you operate a volunteer-based tutor and/or mentor program and include a computer center at your facility, you and your volunteers could be reading these articles and then teaching young people to use the tools. In a few years, they could be creating these stories and in a few more years they might be leading companies or leading the nation, using these technologies as decision support tools. I use Twitter daily because it constantly feeds me new ideas and resources. For instance, yesterday I saw a post about a PolicyMap Social Index map. Today I looked up the site and found a wealth of resources. The map at the left is from a blog article titled, "Social Needs Index", posted on June 25, 2018. In the resources section is a "Mapchats blog" with a collection of useful articles that show "insights into GIS, Data and Mapping". The only negative to this site is that it's not free, except to read the articles. The subscription prices will be out of reach for many....but not all. If you're using data and maps to make a case for investment in specific geographic locations the site is worth adding to your own resource library. I'm adding it to this section in the Tutor/Mentor web library. 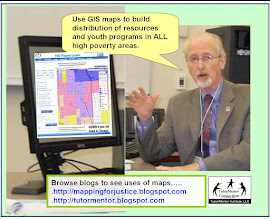 Since 2008 articles on this blog have shown my uses of maps to help fill high poverty areas with youth serving organizations that include volunteer based tutor and/or mentor components. I started using maps for this purpose in 1993. 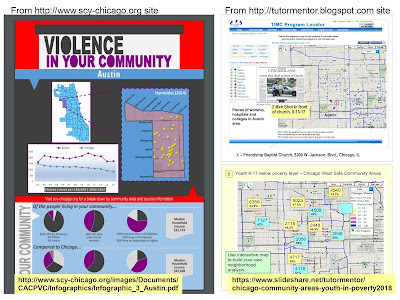 In many of the articles posted since 2011 I've shown map platforms hosted by other organizations in Chicago and in other cities. Some contain different information, or present the information in different formats, than what I've done. I encourage people to learn to use these multiple platforms in their own map-stories and planning strategies. Here's an example. 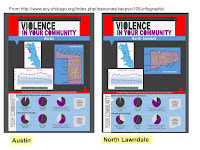 The image below contains three maps showing the West side of Chicago and the Austin neighborhood. 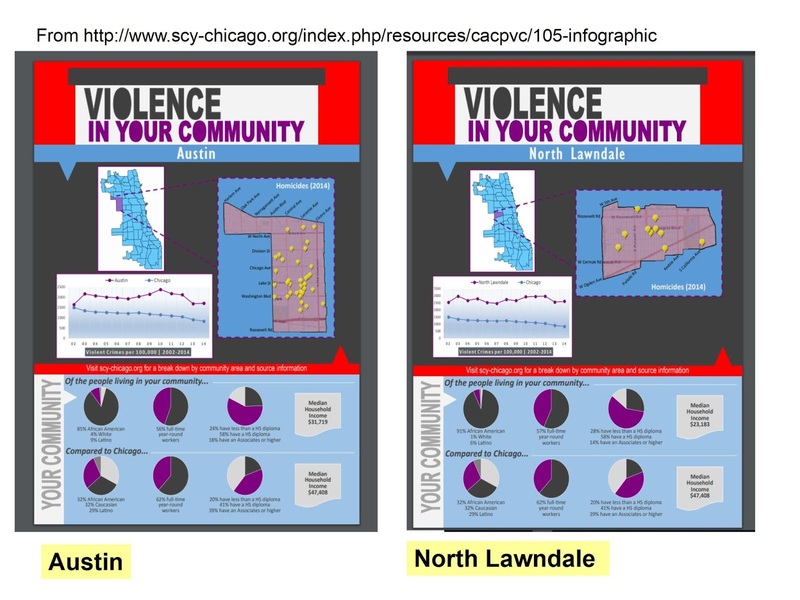 The infographic on the left, with a map showing the Austin neighborhood, and its location in Chicago, can be found on the Strengthening Chicago Youth web site. If you open the link above you will find a page listing all 77 Chicago area community areas, with an infographic like these for each area. Shown are Austin and North Lawndale. Click on the graphic to get an enlarged version. 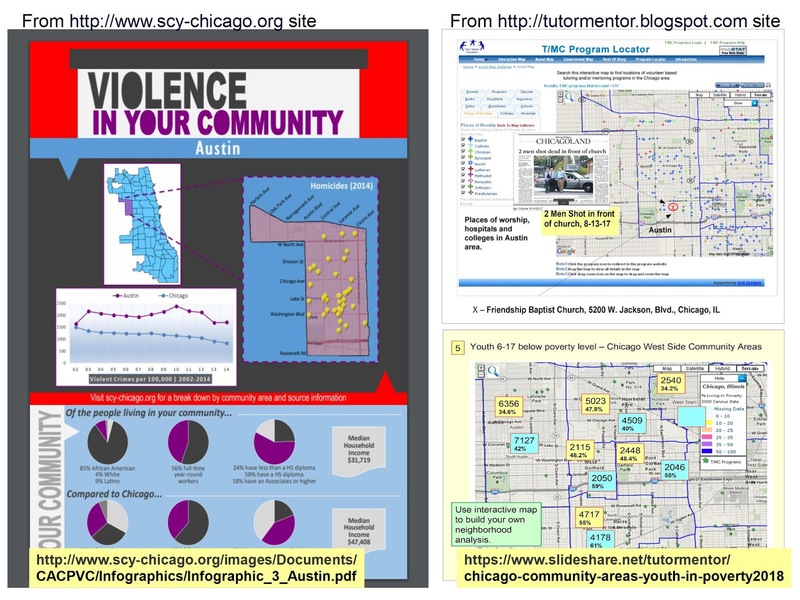 Open the Projects & Resources page of the SCY site and you'll see that the infographics are part of a set of actions intended to bring people together and try to develop strategies that reduce violence in Chicago. I attend the quarterly meetings and get their monthly newsletter. The other two maps shown above are from my collection. 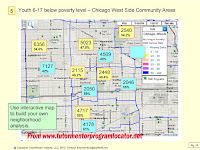 This map is from a pdf presentation showing the number of high poverty youth, age 6-17, in each community area on Chicago's West side. Austin and North Lawndale are at the far left. 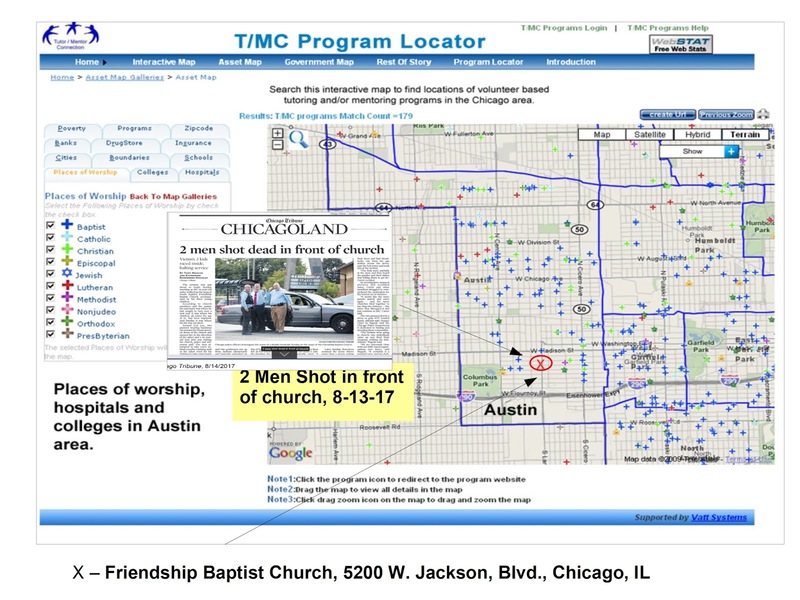 The third map is also from the Program Locator, but I've added on a photo from an August 2017 Chicago Tribune article, reporting on a shooting that took place on the West side of Chicago. I put that map in an article on this blog. For this map story I used the asset map section of the Program Locator, which enables me to show faith groups, banks, hospitals, universities and drug stores in the map area. These are people who need to be strategically involved in helping youth programs and anti-violence solutions grow. I share my blog articles in a monthly email newsletter which I send to people at SCYChicago and many other groups, with the goal that they will borrow some of my ideas to help draw attention to the same issues that they focus on. 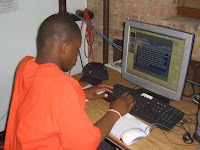 I also show links to SCY and many other Chicago organizations in my newsletters and the Tutor/Mentor web library. If someone is collecting information showing existing service providers as well as assets in an area, then anyone can use that information to invite people to connect in face-to-face and/or on-line gatherings. If we can encourage growing numbers of people to use maps in bringing people together and drawing attention and resources to solutions needed to reduce violence and poverty by helping more kids go safely through school and into adult lives and jobs, we can make Chicago and other cities a better place for everyone to live and raise their families. While I've posted stories on this blog since 2008 I have also posted related stories on the Tutor/Mentor blog since 2005. Spend time browsing through the archives. You'll find many ideas that you can apply to change the future. * Due to a lack of funds and talent the Tutor/Mentor Program Locator has not been upgraded since 2011 and program data has not been updated since 2013. Listen to this short podcast talking about poverty in Illinois. 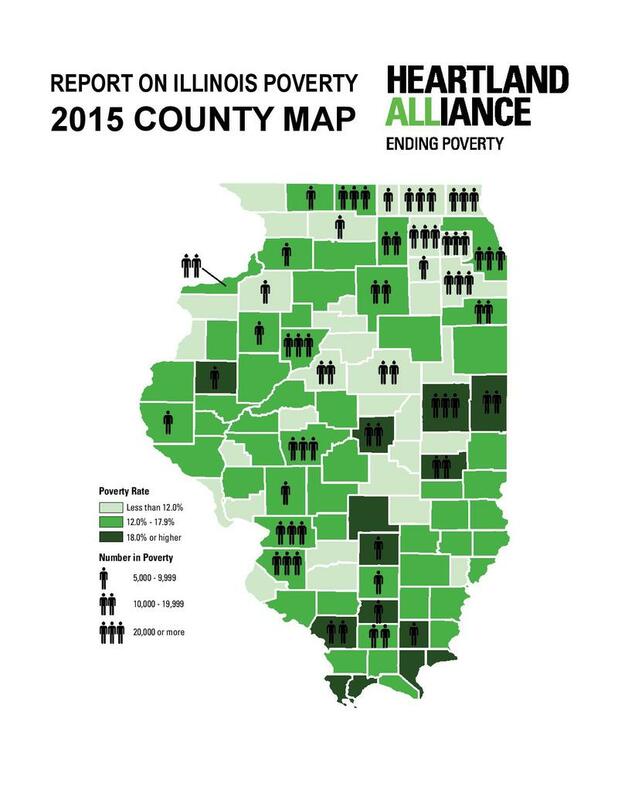 Map and data courtesy of the Heartland Alliance of Illinois. 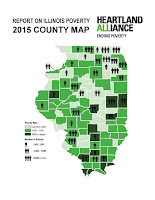 While the number of people living in poverty is highest in Chicago and its suburbs, the greatest concentrations of poverty are in many downstate counties.